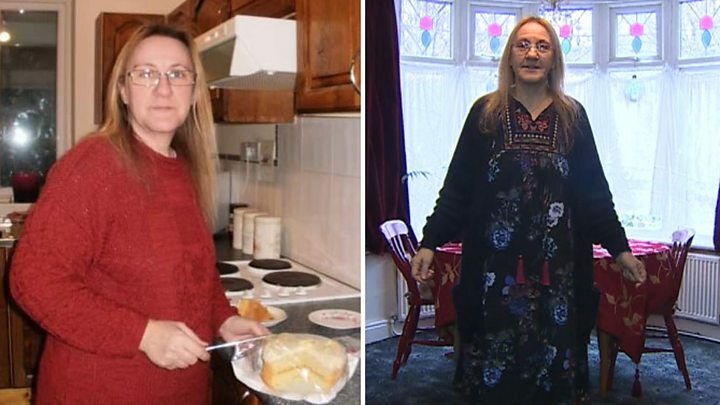 Media captionPat Andrews said the diet had offered her a "lifeline"
A woman deemed at risk of developing type 2 diabetes has been given a clean bill of health and lost 31lb (14kg) in weight after an NHS diet trial that saw her eating just 800 calories a day. Shop worker Pat Andrews, 58, from Chirk, near Wrexham, said the eight-week diet had transformed her life. About 60 people took part in the trial, all losing weight and some cutting the need for medication, dieticians said. Diabetes has been branded a "ticking time bomb" by NHS Wales. "At the end I felt wonderful," said Ms Andrews. In November, NHS England announced that up to 5,000 patients with type 2 diabetes would be prescribed a "very low calorie" diet as it looks to combat the disease by encouraging people to change their lifestyle. In north Wales, two trials have had encouraging results according to diabetic dietician Claire Chaudhry, who works for Betsi Cadwaladr University Health Board. Ms Andrews went from regularly eating cakes, chocolate and biscuits to eight weeks of salad and vegetables, along with shakes and soups, under the NHS "very low calorie" diet trial. "The first week was a little difficult because you get a few side effects," she said. "I felt cold, I felt a bit irritable, and I felt a bit tired and I did feel hunger for the first time in my life. "You always say you are hungry but you are not hungry, you just want something. "And the results were so rapid and so wonderful that I found it easy, because you lost 6lb on the first week and then it was a 1lb to 2lb every week, so it was very good." Post-diet results showed she had reduced her blood glucose level from being "pre diabetic" to within a normal range. Before the diet, Ms Andrews had been thinking about giving up work due to knee pain but that has since eased. "At the end of the diet I had got more energy, more vitality and I just felt good in myself. "It's rather nice to look through the size 14 dresses instead of the size 20s so it is absolutely wonderful from an esteem point of view." Ms Andrews, who now goes to the gym twice a week, does admit to having a sweet treat - but in moderation - and she has reduced her portion sizes. In one trial, about 50 diabetes patients saw an average weight loss of 10kg (22lb) over eight weeks, according to Ms Chaudhry. She said some also saw a reduction in their need for medication related to their diabetes and others stopped needing it altogether. A second trial involving 11 people at risk of developing type 2 diabetes had similar results for weight loss and helped to bring glucose levels to within normal ranges for 10 of them. Ms Chaudhry and colleagues are trying to secure funding to hold a further trial. The number of people diagnosed with diabetes in Wales has increased 46% to 191,000 in the last decade, according to Diabetes UK Cymru. The Welsh Government published a four year plan in 2016 to tackle the disease but it also called on people to take "responsibility for their health and lifestyle". "We are going to have quite an epidemic in the future if we don't look at the way we are eating and our lifestyle," said Ms Chaudhry.